A while back I talked psychographics and defined the four archetypes of the apocalypse. Plus a zombie. 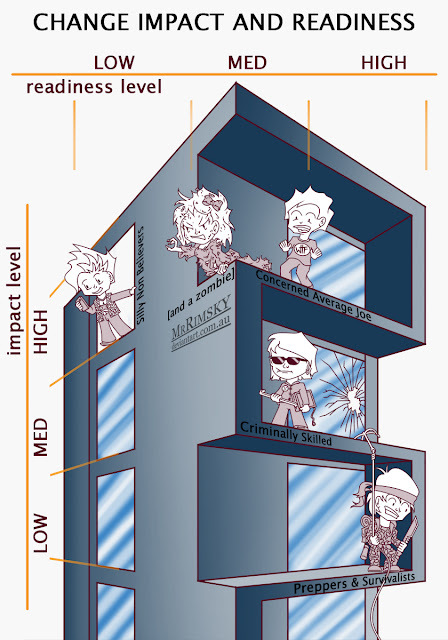 All that was a lead up to a really cool info-diagram using an apartment block. Okay, there is more to it than that. The zombie apocalypse will impact on each archetype differently, and they all have different levels of readiness. So Silly Non Believers will be impacted the most, because they are totally unprepared. Preppers and Survivalists on the other hand are better prepared and so will be impacted the least.